It's always a pleasure to recommend a great place to eat, drink or visit when friends from overseas come to Sydney, so The Style Index is delighted to publish some images of the recently opened 1888 Hotel in Pyrmont. 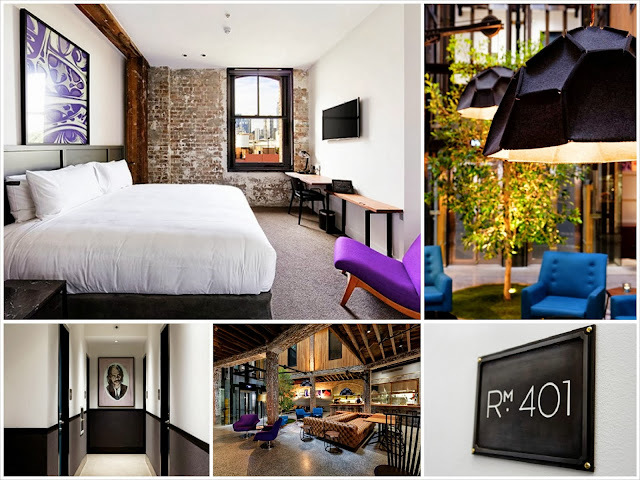 Housed in a building that was originally a wool store and factory constructed in the year 1888, this is one cool boutique hotel. The design, a collaboration between architect Chris Haughton and Interior designer Cressida Kennedy, is inspiring and bold (note the pops of purple - our moodboard theme for tomorrow). Plus, all artworks are Australian – we love the Nick Cave drawing in the corridor. The hotel comes to us from the 8Hotels Boutique Hotel Company who have launched a snappy campaign to intrigue and enchant would-be guests. Each month, one lucky guest will win an additonal night's stay free for the best Instagram picture posted with #1888hotel. Plus, all Instagram users with over 10,000 followers get a free night at the hotel. Finally, all hotel guests are invited to go on a custom-made ‘Insta-walk’ at their leisure. The Insta-walk is a map of local places and landmarks that are perfect for snapping through an Instagram lens.